Electricity produced from reflected sunlight using large arrays of mirrors constructed in the desert Southwest is expected to more than double this year, thanks to several large solar thermal power plants that are scheduled to begin operating soon in Arizona and California, the U.S. Energy Information Administration announced in a report Thursday. The two biggest solar thermal power plants that will be operating by the end of the year could power more than 200,000 homes in the Southwest. Solar energy, produced from both photovoltaic and solar thermal, particularly on public lands in the West, is part of the Obama administration’s Climate Action Plan, which calls for more solar power plants to be permitted on public lands as a way to generate clean energy, combatting climate change. The plan, which was released in June, touts 25 utility-scale solar plants that the administration has permitted on public lands since 2009. 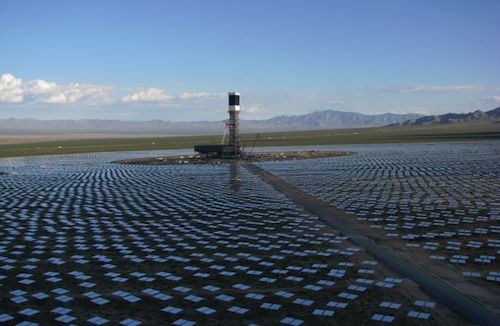 Solar thermal power plants use arrays of mirrors to focus sunlight on water or another fluid, heating the liquid and turning a turbine, generating electricity. They do not use photovoltaic cells common with rooftop solar generating installations and other larger solar power plants. The two largest solar thermal power plants beginning operation this year are Abengoa Solar’s 250-megawatt Solana power plant in Gila Bend, Ariz., and BrightSource Energy’s 392-megawatt Ivanpah Solar Electric Generating System in California’s Mojave Desert. Both plants are larger than any other solar thermal generating station ever built in the U.S.
Until the technology and economics of solar thermal are proven, little growth in capacity is expected after 2016, she said. Solar thermal power plants are expensive — costing up to $2.2 billion each — and some developers have canceled their solar-thermal projects in favor of photovoltaic power generators, which are seen to be less expensive to build and operate since photovoltaic costs have dropped in recent years, she said. Photovoltaic — built with solar panels — and solar thermal are two distinct technologies, Bredehoeft said. Solana, which began operating in October, collects sunlight using “parabolic mirrored troughs,” which track the movement of the sun and focus the reflected sunlight onto a tube filled with heat transfer fluid-filled that runs through the center of the trough, according to the EIA. The plant also includes thermal storage, which the EIA says will allow the plant to generate electricity for six hours using only stored energy. The plant is expected to generate enough electricity to provide power to 70,000 homes. The Ivanpah plant, located on public Bureau of Land Management land 50 miles northwest of Needles, Calif., uses a giant array of mirrors positioned in a large circle around three “power towers.” The mirrors focus sunlight on a boiler at the top of a 459-foot tower in the center of the circle, generating steam and turning an electric turbine, the EIA report says. The plant is expected to generate enough electricity to power 140,000 homes in California. Federal loan guarantees totaled $1.45 billion for the Solana project and $1.6 billion for Ivanpah, according to the EIA.